Cultivating creative leaders for a dynamic world. 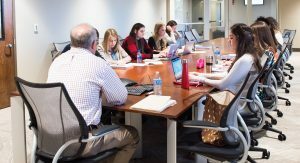 Faculty in the Department of Advertising and Public Relations are innovators in their fields and leaders in their classrooms. Highly regarded across the country and around the world for their research and creative activity, APR faculty’s work is routinely recognized, awarded and published in top, scholarly publications. Faculty in the Department of Advertising and Public Relations can easily locate useful forms, resources and information in our UA Box. For a look at our faculty’s research and creative activity, visit the College’s research page or locate them on the comprehensive, college directory. For information on Department of Advertising and Public Relations faculty members, visit our searchable faculty directory page.